You'll be £25.00 closer to your next £10.00 credit when you purchase British Railways in Transition. What's this? This is a book about the years following the transition from steam to diesel and electric traction on British Railways, covering a period from 1964-1997. 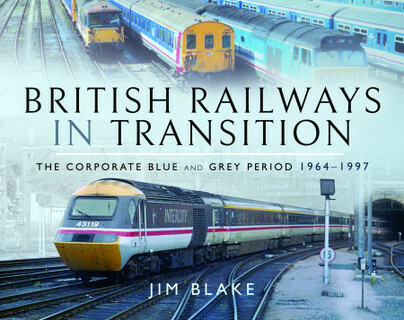 The author Jim Blake, took a huge number of pictures during these years, covering many aspects of British railway and bus operation, both in the London area, where he lives, and also around the country. This book looks at the railway scene in decline, trying to come to terms with the post Beeching, post steam era, before a change of political will, that has seen much rail investment in recent times. The volume not only looks at locomotives and trains, but also the overall railway scene of these years of great change since the 1960s. Each entry has a detailed commentary explaining what is going on and just by looking at the photographs you will be taken back to a time when things were a little more simple and the railways were perhaps more interesting than they are today. A very interesting image file. A must-have book, not only for English railway fans, but for all railroad fans for their high-quality photographs.